My detailed Hockey Skate and Sticks design measures about 20mm wide and is a nice medium weight. The design and torpedo style flip cuff link mechanism are professionally soldered and the entire piece is plated in Sterling Silver. This design is also available in a 24K Gold Plated finish. I love it! I'm sure our hockey player will enjoy wearing it after his games and wear it just to show off his passion! Only reason it didnt get 5 stars was one of the hockey sticks were bent to the side! I was able to bend it back and it looks like it will be fine.. I do think that yall should put "Fragile" on the envelope because although it was inside of a gift box it was still semi crushed by someone in the mail delivery service. Sturdy quality. They look great! 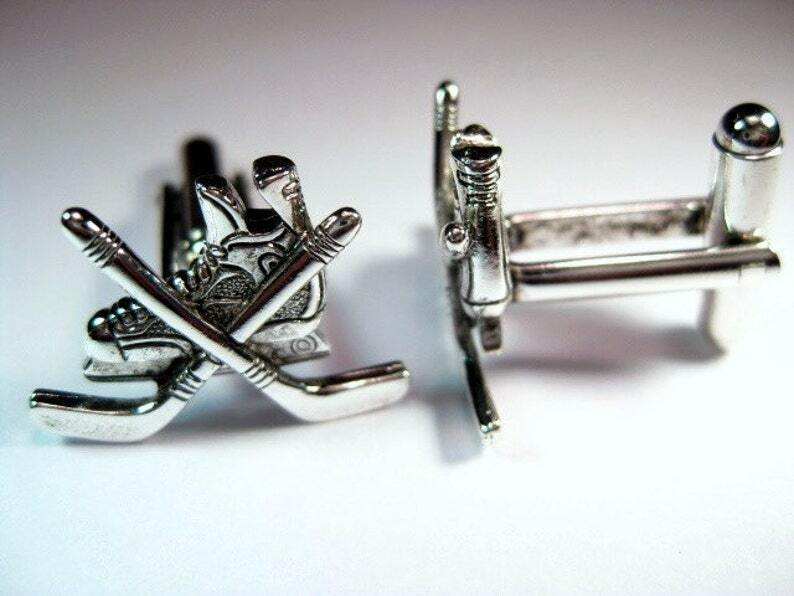 These were perfect for my hockey player son for his senior prom. He loved them.